TeamCME Training: Drug: DOT Urine Specimen Collector Training Complete <strong>DOT Urine Specimen Collector Training</strong> This accredited 2 part online course satisfies the DOT requirements for "Qualification" and "Proficiency Demonstration" training to be accredited as a DOT Urine Specimen Collector. Only Accredited DOT Urine Specimen Collectors are qualified to perform collections for DOT drug testing programs. This course can be used for Initial Training or the DOT 5 Year Recertification Training requirement. Those that complete both parts of this training course will receive a certificate as a TeamCME Accredited DOT Urine Specimen Collector. <strong>Part 1 Qualification Training:</strong> When you purchase this product, you will be automatically logged in and forwarded to the "Qualification" training page, videos, and content. You have unlimited access to the "Qualification" page to complete your training according to your schedule. 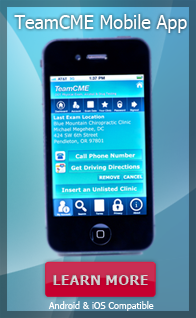 Gain access the "Qualification" training page through the "Physicians" menu drop down box in the navigation bar located near the top of the TeamCME homepage. An access code will be shown upon checkout to access the "Qualification" page. If you pruchased this training, are a TeamCME member, and are logged into your TeamCME account, the access code is not needed for you to gain access to the "Qualification" page. Included as part of the "Qualfication" training is access to the file to print your Urine Specimen Collector Training Manual and other documents. <strong>Part 2 Proficiency Demonstration</strong> Provided as a live Skype conference with a TeamCME staff member, please call TeamCME to schedule your "Proficiency Demonstration" after you have completed the qualification training described above. The proficiency demonstration usually takes 90 minutes to complete. You will receive instructions on how to set up a free Skype account and your computer must have a web-cam feature or an attached web-cam for video transmission. DOT Urine Specimen Collector Training This accredited 2 part online course satisfies the DOT requirements for "Qualification" and "Proficiency Demonstration" training to be accredited as a DOT Urine Specimen Collector. Only Accredited DOT Urine Specimen Collectors are qualified to perform collections for DOT drug testing programs. This course can be used for Initial Training or the DOT 5 Year Recertification Training requirement. Those that complete both parts of this training course will receive a certificate as a TeamCME Accredited DOT Urine Specimen Collector. Part 1 Qualification Training: When you purchase this product, you will be automatically logged in and forwarded to the "Qualification" training page, videos, and content. You have unlimited access to the "Qualification" page to complete your training according to your schedule. Gain access the "Qualification" training page through the "Physicians" menu drop down box in the navigation bar located near the top of the TeamCME homepage. An access code will be shown upon checkout to access the "Qualification" page. If you pruchased this training, are a TeamCME member, and are logged into your TeamCME account, the access code is not needed for you to gain access to the "Qualification" page. Included as part of the "Qualfication" training is access to the file to print your Urine Specimen Collector Training Manual and other documents. Part 2 Proficiency Demonstration Provided as a live Skype conference with a TeamCME staff member, please call TeamCME to schedule your "Proficiency Demonstration" after you have completed the qualification training described above. The proficiency demonstration usually takes 90 minutes to complete. You will receive instructions on how to set up a free Skype account and your computer must have a web-cam feature or an attached web-cam for video transmission.